Disc or drum brakes, new brake pads or shoes. For most cars and light trucks. Some restrictions apply. Not valid with other offer or special. I have lived in the Horsham area for a short time. When my car need service there as a wide variety of automotive mechanics to bring my car. I brought my car to Rusty though and have not looked back, Myers auto care is the kind of business that everyone wishes they knew about. The fair prices, timely work, and knowledgeable staff makes it a pleasure to bring my vehicle here. I recommend Myers auto care to all my family and friends. Myers Auto Care truly is a blessing especially to someone like me who is a full time student, full time employee, and full time father of two. If you're looking for the very best auto repair center in Horsham, PA, you've come to the right place! 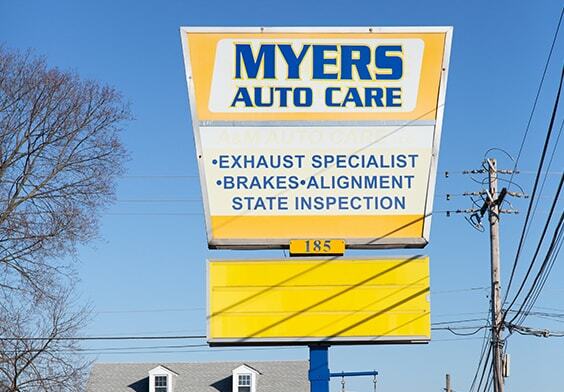 Myers Auto Care has been serving Horsham and surrounding communities since 2001. We provide excellent automotive service and maintenance, specializing in alignments, tires, and custom exhaust work for all American and Asian vehicles. Enjoy our comfortable waiting area while we diligently work on your vehicle. Need a shuttle? We provide free shuttle service to all local areas Monday through Friday beginning at 7:00 a.m. Give us a call today! We're here to help.